In 2014, George Huitker decided to merge his love of music and service education, and convinced his band, Junk Sculpture, to undertake a life-changing tour of north-western New South Wales. This was the very region where his service learning program was introducing his urban-based students to rural communities, to gain a better understanding of life in rural Australia, particularly for Indigenous children and their families. With Midnight Oil’s in uential album Diesel and Dust on heavy rotation, Huitker emulated this band’s ground-breaking Blackfella/Whitefella tour and hit the dusty, straight, corrugated roads heading northward on a journey of discovery... On the way, the travellers discovered some hard truths about themselves, their preconceptions and their country’s history, and how best to serve its disempowered and disadvantaged people with greater authenticity. In an honest, heartfelt and at times heart-breaking memoir, George Huitker shares this journey while tracing his own songlines and how they instilled his passion for singing and serving others. Contains a foreword by Matt Pye. When his mother is diagnosed with ‘the caterpillar of dementia’, George Huitker is forced to reassess both of their lives so that they can move forward as the illness eats away at their relationship. In an attempt to thread together his own experiences, Huitker begins to reveal to his mother memories and matters close to his heart that he had previously kept from her. In doing so, he draws together the fractured pieces of her own fading memory and slowly repairs some of the damage done by dementia’s appetite for the past. In this raw, moving and tragicomic memoir which traces the foundation of his teamSUPPORT project at Radford College, the award-winning author of Not Just Footy and How to Succeed Without Really Winning explores the need for compassion in the face of adversity and the indelible impression that adults can have in the shaping of little lives. And vice versa. Contains a new foreword by John Foulcher. Have you ever wanted to kill a referee, sports administrator or opposition players, parent or innocent spectator? Do you feel dirty when shaking hands with the opposition? 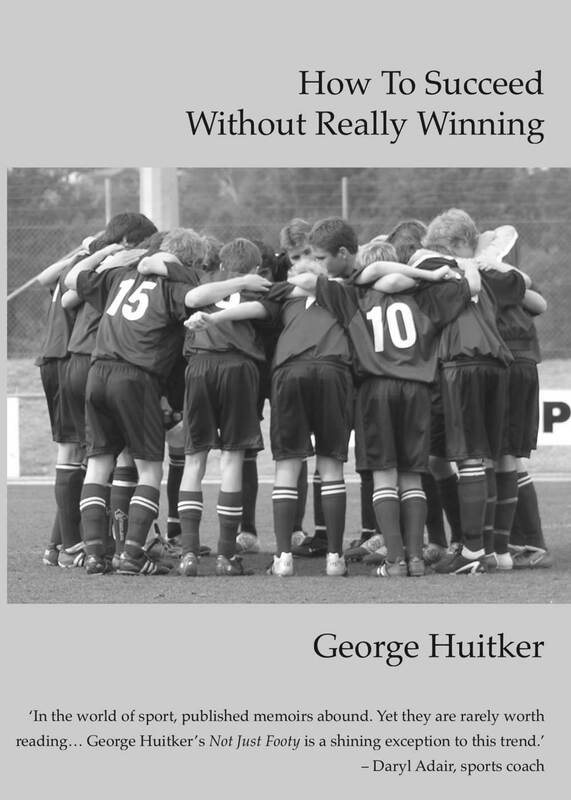 In a world where success appears to be the only desirable endpoint in our competitive modern lives, George Huitker asks us to reconsider whether that really needs to be the case. Prompted by the bizarre behaviour of sideline parents from hell in junior sport - and with a will to erase his own sporting demons - Huitker reflects on thirty years of experience as a player, coach and administrator. Contains a new foreword by Ryan Carters. In a world where sporting experiences are becoming too intense and potentially soul-destroying for children and young adults, George Huitker takes a trip into his past to find out where the real moments of unadulterated joy, wonder and enrichment in sport really lie. The lessons he learns from his father, friends and players make for an hilarious, sometimes bitter-sweet journey across the sports fields from Canberra to the UK. This third edition of his tragicomic reflection on junior sporting experiences – as both a player and a coach – comes with a new forward by former Joey’s captain, Kaz Patafta, and extra photographs from the stage adaptation. In this collected works by George Huitker we are given highlights of the poet’s career over the past ten years. Huitker brings together here a great variety of poems in style and form, poems that have been widely published, a number having received prizes in poetry awards. In this anthology the solidity of family, children, acquaintances, city buses, first loves and, very strongly, the Australian landscape, lead the reader into the psyche of the poet. A psyche that is aware of the fine nuances of relationships and life. Huitker’s poetry is muscular, topical and perceptive. George Huitker’s second collection of poems intensifies and widens the concerns of his first book, An Unfamiliar Sea. The poems here are vivid and striking, yet admirably modest: in his exploration of the ordinary things in life, Huitker refuses to sacrifice the particularity of experience for grand gestures of meaning. Instead, experiences drawn from teaching in a high school, family entanglements and voices half-heard in the rush of living - these are allowed to be intensely themselves, to live. In demotic diction George Huitker writes quiet, reverent, elegiac poems. Metaphors for human life and feeling emerge from the everyday. A football team's victory at Easter provokes thoughts of other triumphs and salvations. A one-day cricket match suggests the possibility of last minute moral elevation. A surfer caught in a rip does as image for the grief of a loved one's death. A creaky gifted car personifies the giver in his enfeeblement and affection. The mental and the metaphysical are facets of the one reality. The reverence is engaging and egalitarian.